During recent meetings in Charlotte, NC, various GCI leaders who have recently retired, or are about to retire, were honored for their years of service as GCI employees. One of the honorees was Gary Moore, who retired at the end of August from serving as National Director of GCI-Canada. Following graduation from Ambassador College in Pasadena, CA, Gary entered the employed ministry of Worldwide Church of God (later Grace Communion International). Over the next 24 years, Gary pastored WCG congregations in the Canadian provinces of Ontario (including a US church in New York State), New Brunswick, Alberta and Nova Scotia. 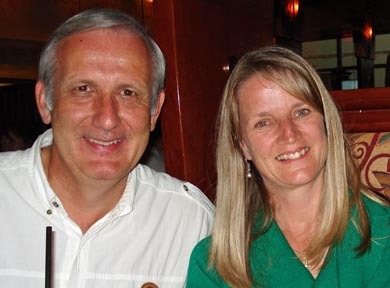 Then in 1997, Gary left the pastorate to begin serving as GCI-Canada’s National Director. At a celebration of his retirement, Gary mentioned that he feels “blessed and privileged to have experienced the life I have had.” He explained that his journey from a legalistic approach to Christianity to one firmly anchored in the grace of God in Christ has been “a wonderful experience.” In retirement, Gary hopes to continue serving God and his people as long as he has the energy and health to do so. Bill Hall has replaced Gary as National Director of GCI-Canada. Thank you Gary and Wendy for the many years of service to GCI! Thank you so much for your long turn labors for our Lord Jesus Christ! How inspiring to read about the wonderful works God has involved you in. May our Great God continue to bless you both with other lighter loads and enjoyment of such as you get some needed rest and family time! Blessings and Hope from us to you both. Respectfully, David and Linda Husmann. We thank God for your faithful service through the years. God bless you and Wendy in this new chapter of your life. A retired pastor friend of mine mentioned that it is amazing how God continues to work with them even in their retirement. Thanks for your love and passion for our lord Jesus. Thank you so very much for your many years of encouragement and support for all the Canadian churches and Hands of Hope in Winnipeg. We pray that our God will bless you in your ongoing involvement in God’s work in Canada. Serving the church with you these past years has been both a privilege and a pleasure. We always enjoyed the talks and the hours spent together at international conferences. Looking forward to whenever we may meet again. Hi Gary and Wendy. Enjoyed our time together recently. Enjoy your time to come with reduced stress yet with greater impression and expression of the God you love and his love still spreading from you to others. Just want to wish you well in your retirement. From South Africa, we also want to thank you and Wendy for the service you offered to Southern Africa. I speak for many here, that your contribution to GCI here over the many years has been invaluable. All the best.